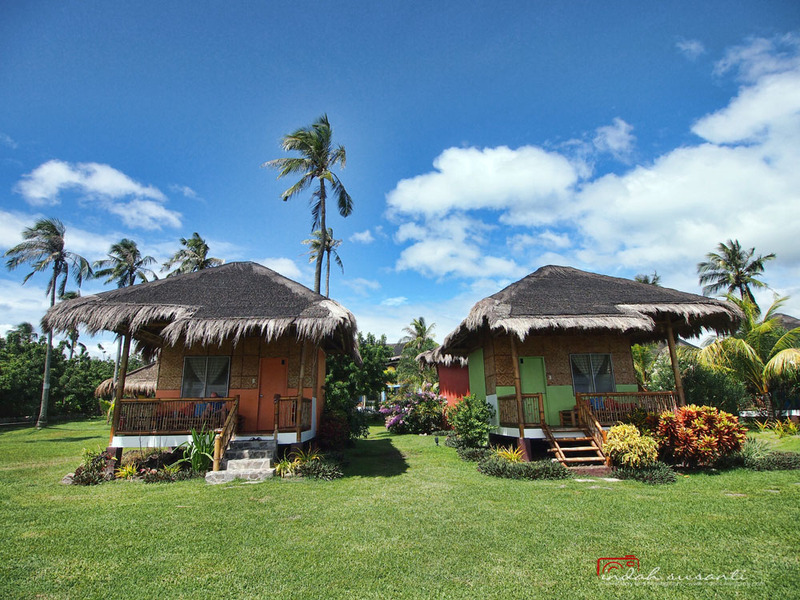 During our scuba diving holiday in Dauin (Dumaguete, the Philippines), Dutchie and I stayed at Liquid Dumaguete Dive Resort. 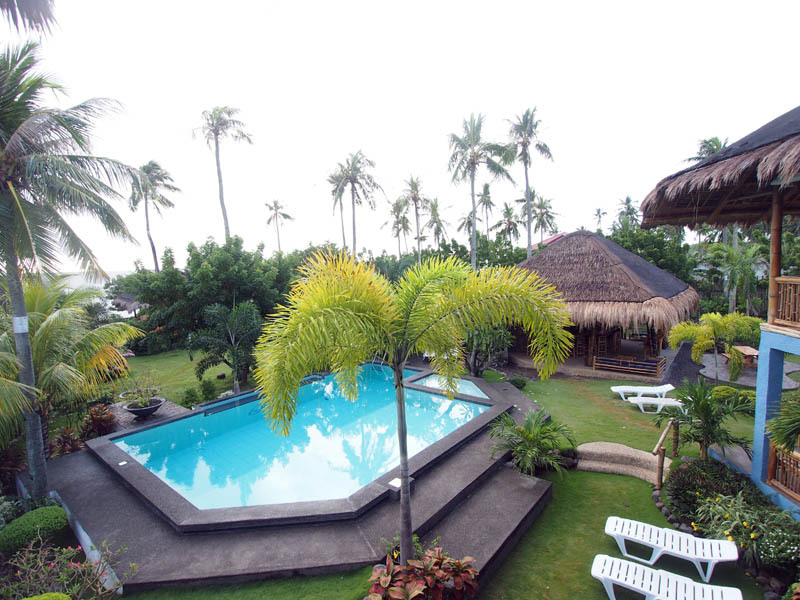 The location is secluded next to the beach, away from busy roads. We had a wonderful time in this resort, from the beginning of our stay to the end, Dutchie and I kept smiling. Oh, we wish we could stay longer! The Boat & Crews. The dive resort has good boats. They were clean, huge and comfortable for ten scuba divers or more plus a restroom. 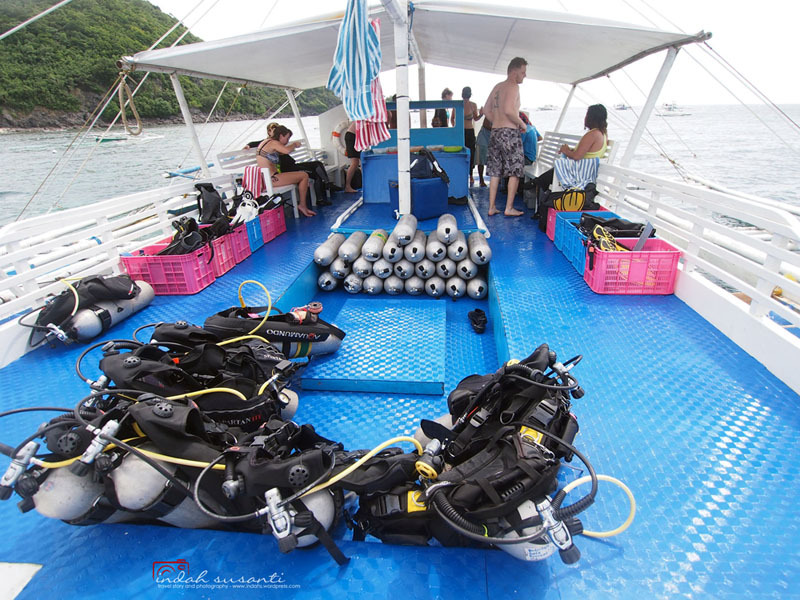 The boat crews were helpful, and the diving gear resembled on time. The only downside was the effort to enter the boat from the resort’s beach. It was a drama especially when the sea was bit choppy. The resort had no boat jetty, which was totally fine, especially since the consideration of not having the jetty was to preserve the nature of the area. Dive Guide. We were diving in the same dive sites with the newly certified open water scuba divers, but Dutchie and I were diving separately from them. We were accompanied by Alan, a divemaster who privately guided us during our dives. I appreciate the resort’s consideration because the bottom time (time spent underwater) of a new scuba diver and experienced scuba diver were usually different. Plus, we were allowed to dive up to 60 minutes. Alan was an experienced dive guide, and he spotted many weird species during our dives. Diving Schedule Management. The time for diving briefing was clearly mentioned and conducted on time. The dive sites to visit were scheduled on a daily basis and informed in advance. Diving to Apo Island took a day trip with extra charges: three dives with lunch and snacks provided on the boat. Location. The resort is located far away from busy street and set up laid back in front of the beach. Once you were there, you just stuck. Hah! 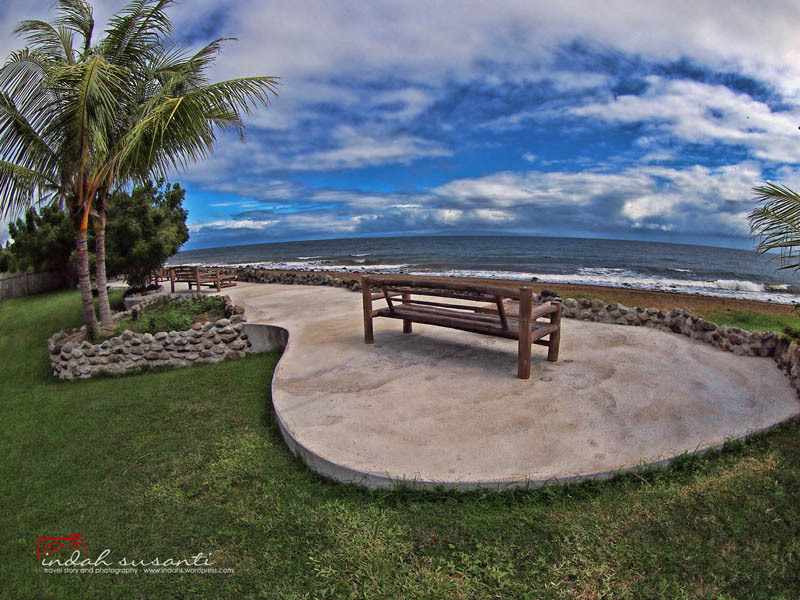 The resort provides transport if you wish to go to the town or to travel around Dumaguete. Room & Sleeping Quality. We were placed in a bungalow with the beach view, a huge room with terrace, and clean. It was almost perfect, but I missed water cooker to make tea and coffee in the morning. It’s a small thing, but since our bungalow was bit far from the restaurant, it was annoying to wake up in the morning and had to walk to the restaurant just for coffee or tea. We love to start our morning with a cup of tea or coffee. P.S. : No television (who needs television when on a beach holiday?) nor air conditioning available in the bungalow. A fan was available in the bungalow and surprisingly it was cold enough for us. Resort Amenities. The resort has free wi-fi, swimming pool, a restaurant with a view, a lounge area for reading, and a bar. Plus: friendly resort dogs to pet! The Restaurant & Food Quality. We booked our diving on the half-board package which means we get breakfast and lunch included. The breakfast and lunch offered warm meals with a variety of menu. The menu kept changing every day, and but for dinner mostly the menu was nonlocal’s food. I did not have any problems with the North American or European dish, but I’d preferred to try local food thus we also had dinner outside the resort. Our favorite was a restaurant at Drill Shack Resort, nearby to the resort, just walking distance from the beach. 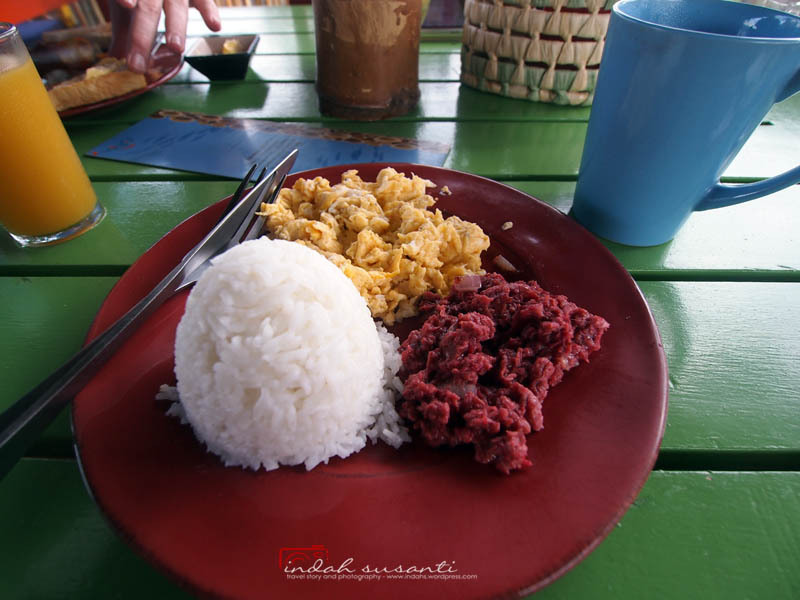 The service of Drill Shack Resort Restaurant was super slow but the Philippines meals there were delicious; especially Bicol Express – a spicy stew of meat (or vegetables for vegetarian) with coconut milk. The Bar. I loved their bar, and the bartender was super friendly. It was scary at the same time, the friendlier they were, the more you would drink 😀 The wine collection was limited, but they were preserved in proper wine cooler, so the taste was as fine. The bar also offers a variety of cocktails. Overall, it was a comfy place to hang out and socializing with other scuba divers after diving and after dining. 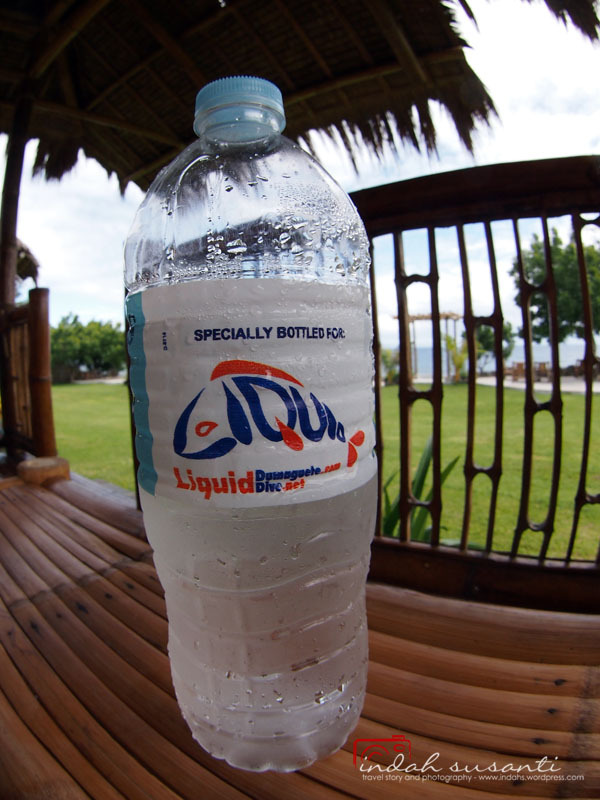 I enjoyed my stay at Liquid Dumaguete Dive Resort; the diving was exceptional (an experienced dive guide was the key! ), and the service was good. There was minor room for improvements such as dining menu and amenities in the bungalow. But you can overcome these issues easily. Based on this experience, I would not mind returning to this resort, and perhaps by now the resort is improving. 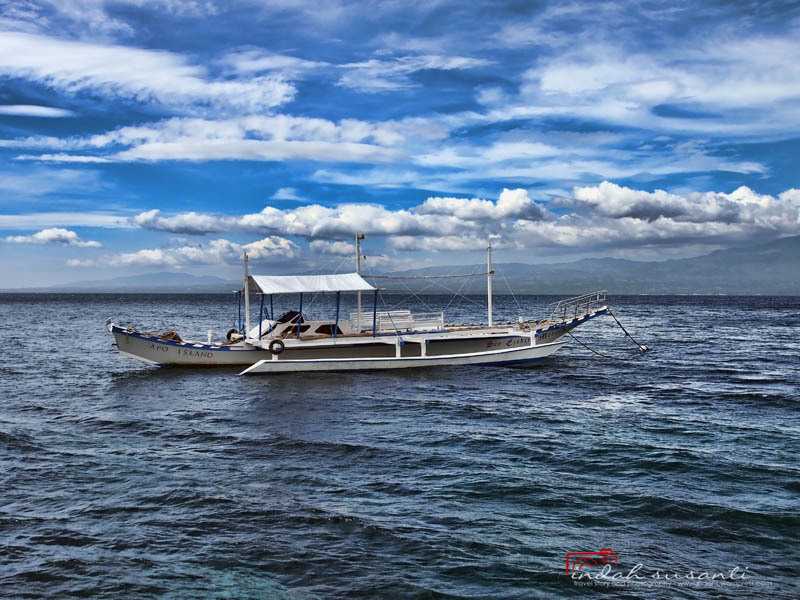 Our diving stories with Liquid Dumaguete Dive Resort as you can read in the following posts: Apo Island – Diving with Turtles and Dauin: Muck Diving with the Clowns. The views and opinions expressed on this reviews are my own. Diving just looks so wonderful especially with your images. Awesome review….and I love the fact that there is no tv! This seems to be a nice resort. Do they have an in-house reef? Yes, they do, two dive sites close by to their beach. One of them has thermal hot springs underwater – Mainit dive site. Meanwhile, the second dive site is more for night dive. But we still had to get into a boat to dive there – it was for safety reason because there was no jetty. 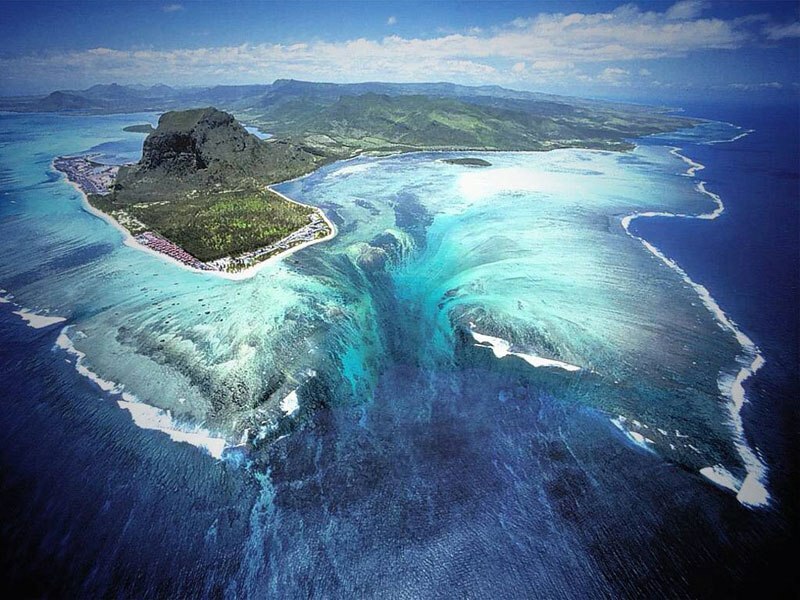 Oooh, we would love to check out those underwater hot springs.